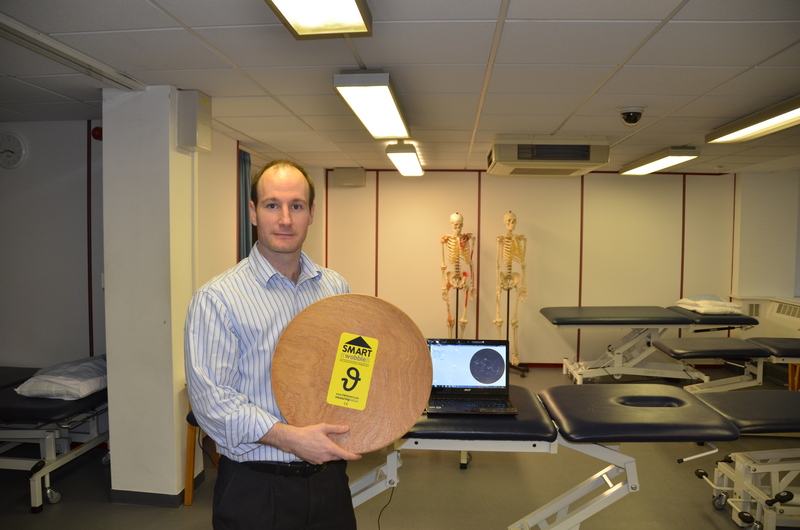 Dr Jonathan Williams with the SMARTwobble wobbleboard designed to measure and improve patients’ balance. A physiotherapy lecturer at Bournemouth University (BU) has created a new interactive wobbleboard that will allow clinicians to better measure improvements in patients’ balance. The SMARTwobble, created by BU’s Dr Jonathan Williams, is wirelessly linked to computer software that objectively measures wobbleboard performance, calculating a score which patients can then work on improving. Wobbleboards are used by physiotherapists, chiropractors, osteopaths and sports therapists to improve patients’ balance and proprioception and prevent the risk of recurrence following an injury. A patient will come in and use the wobbleboard, then come back and use it again at a later date but it is very hard to tell if they have got any better or not,” he said. With this board, you will be able to see if a patient is below par and set a key objective for them to work towards. The SMARTwobble has a sensor inside which measures the degree of wobbleboard tilt when a patient is on it. It then creates a report, which a clinician can use to measure the performance against previous attempts and the average score of a person who does not have an injury. Dr Williams said: “It will allow clinicians to be objective with their assessments. “At the moment we have to guess and it is hard to say what is bad and what is good or how much better a patient is performing – you are purely going on what you can see. As well as testing performance, the SMARTwobble also features interactive games, where a patient uses the wobbleboard like a joystick to negotiate a ball around a maze. “When a patient is standing on a wobbleboard for 2 or 3 minutes at a time, it can get a bit boring for them,” said Dr Williams. We have put it in front of our students to test, and they love a good gadget so they think it’s great. We’ve had staff competing with each other and a bit of friendly competition is great to boost performance. Dr Williams first had the idea for the board around a year ago and has spent the last six months working on developing the idea and prototypes with company THETAmetrix. The SMARTwobble will now be placed in a number of different local clinics for people to try out and give feedback. Dr Williams said he hopes that the board – which will cost around £250 – will be embraced by clinicians, therapists and even sports teams as a method of testing balance which is known to contribute to the risk of a player getting injured. 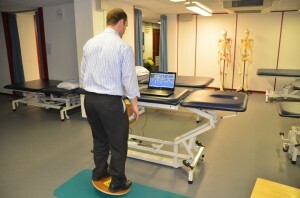 Dr Jonathan Williams’ SMARTwobble wobbleboard in action.